If a manager is to transform a group of individuals into a team, challenging goals must be set that staff can achieve by working together. Close working relationships can be forged when employees solve problems as a team. Find a suitable project and discuss it with the team. There is no need for it to be a problem that requires huge amounts of resources or time to solve, but remember it has to be a task for everyone, so do not delegate it to an individual or small group. Get views and suggestions from every team member and then set a clear target to get the problem solved. When a solution is found, praise and reward the team as a whole. Take the opportunity to highlight any increased efficiency or productivity, as doing so can establish the criteria for success. Then find another project, preferably a bigger one, for the team to tackle next. There is more chance of an effective team emerging if a manager has set staff an urgent and meaningful task. The best teams will then go on to manage their own performance expectations, and will still be flexible enough to allow changes to shape their approach, purpose and goals. A manager should help the team create a set of rules that team members must abide by. For instance, allow constructive confrontation, but not finger pointing, as this can harm morale. Encourage an analytical approach and open discussion, but ensure no-one is above criticism. Make attendance at team meetings mandatory and do not allow interruptions. Most importantly, ensure every member of the team does real work towards achieving the goal. Keep the team informed, thereby allowing staff to improve their understanding of objectives and set clearer goals. Try to manage the way information is delivered in order to build trust. For example, a manager should make it clear when they are expressing their own personal opinion, that of the company, or that of the team as a whole. Show respect when communicating with the team. Talk last in discussions, after the others have been heard, and allow team members to take turns leading the meetings. The best managers exploit the power of positive feedback and rewards, and will also focus on development as well as performance. Show pride in the team and be loyal to it by sharing the credit and rewards for achievements. Team building requires staff to spend a lot of time together bonding, especially in the beginning and, ideally, the time spent together should be both scheduled and unscheduled. 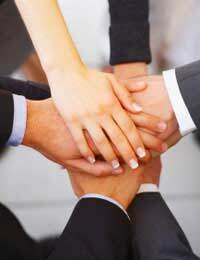 Make teamwork the norm show trust in the team by delegating decision-making authority in key areas. Do not interfere if the team is working well, but take time to review the team’s work and be ready to take the lead. Be aware that staff will probably differ in ages, motivations, interests, needs and cultural backgrounds. Team building exercises should break down these barriers, but keep a check on the morale of individuals and ensure everyone feels like a valuable member of the team.